Customers find your business now through the internet. Internet is 90% of the time the source through which your customers find you and most of the time this starts with a web search. Hence it’s important for your website to be optimized for easy access to search engines. At the same time, ensure that an SEO plan is drawn up that involves all the key parameters the search engine looks for to rank your site based on the authority. 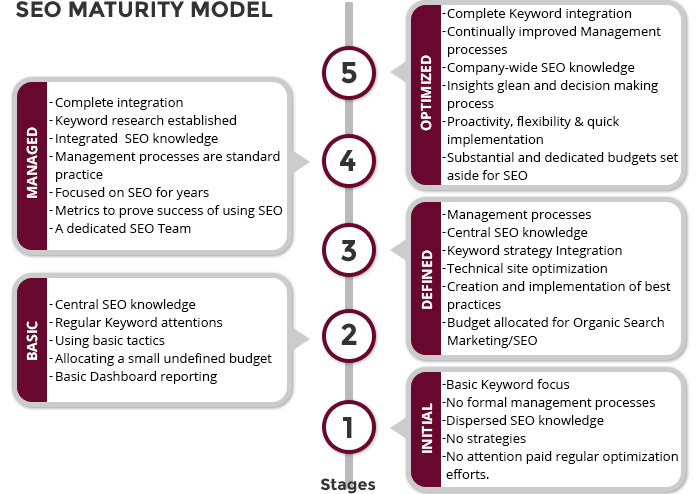 We provide SEO services and plans at Carmatec Qatar to help you rank at the top of web results. We follow a SEO maturity model that evaluates and places a website / domain at a specific stage and our packages are mapped so as to transition from one stage to another of the maturity model. The maturity model is shown below. On page SEO is that part of SEO where the work is done on the actual web page content, structure and layout. Also, meta tags are written to describe the page content and tags are assigned to specific pages to denote the type of data that the page contains. This helps the search engines to understand and place the data in the website for specific keywords. Off page SEO denotes the various activities that are performed as part of a marketing program to generate relevant links from high quality websites. This shows the authority of the website and is created naturally and through listings that are created as part of continuous company PR. Website optimization not only increases your website’s ranking on search engines but also ensures that your website runs quickly and smoothly. Our website optimization process of making changes on your website can produce dramatically enhanced results with your website’s lead conversion rate. Content is the cornerstone of a successful website. The content should be as precise and to the point as possible and specifically appealing to the target audience of your website.At Carmatec our Smart Web Design take care of your content strategy in such a way that it’s fine tuned for your specific need and business result. Local SEO is for the companies targeting regional customers within a specific area and International SEO is for the companies who want to offer their services to the global markets. Whether your customer base is local or International we have the SEO strategy for you.